At True Balance Longevity Med Spa, we offer a comprehensive selection of injectable fillers, enabling us to meet the unique needs of our patients. Because each filler is formulated to address signs of aging in specific areas of the body, it is important that you select one intended to treat your areas of concern. During your initial consultation at our Sherwood Park, Spruce Grove, or St. Albert location, we will listen to your concerns, assess your problem areas, and help you decide which type of dermal filler is best for your needs. Nearly all of the injectable fillers available at True Balance will provide results for six months or longer. Some may continue to provide a more youthful look for 24 months or more. During your initial consultation, we will provide you with information about all of your options to make sure you are selecting the filler that will be best for your needs, desires, and lasting satisfaction. Dermal fillers work to add volume by stimulating collagen production or increasing levels of hyaluronic acid in the skin. Injectable options like BOTOX® Cosmetic and Dysport are neuromodulators that relax tense muscles to help overlying skin smooth out, thereby reducing wrinkles in the treatment area. Neuromodulators block signals between the nerve and the muscle, allowing muscles to relax and drastically reducing the appearance of wrinkles around the eyes (crow’s feet) and in between eyebrows. These options will produce results for four to six months, but will need to be repeated at least twice a year for continued benefit. 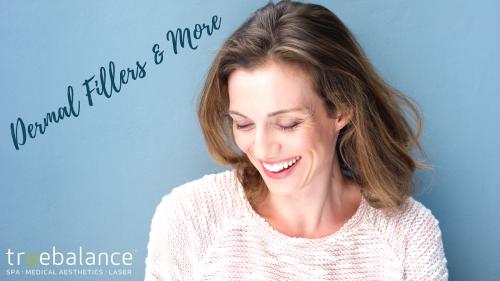 The most effective way to learn which type of filler is best for your needs is through a private consultation with one of the doctors or nurse injectors at True Balance. During this consultation, we will listen to all of your concerns and provide you with honest and useful information about your options to help guide you toward the most effective treatments for your needs. Call True Balance Longevity Med Spa at 780-306-4331 to schedule an appointment at our Sherwood Park location. For appointments in Spruce Grove, call 780-306-7676 and in St. Albert, 587-507-4632. We proudly serve the Edmonton area and all surrounding Alberta communities.